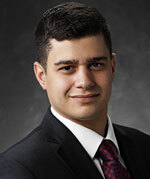 Tony L. Hatzilabrou is an associate with Peters & Nye LLP. Since joining Peters & Nye, Mr. Hatzilabrou has focused his practice on various types of professional liability insurance, including Directors and Officers and Employment Practices coverages. Mr. Hatzilabrou serves as monitoring and coverage counsel to various insurers. Before joining Peters & Nye, Mr. Hatzilabrou’s practice focused on civil litigation in the Chicagoland area. While in law school, Mr. Hatzilabrou was Articles Editor, Wisconsin International Law Journal, a student attorney with the Wisconsin Innocence Project and a member of the Mock Trial Team.